This year’s OSEP Leadership Conference took place July 17 – 19 in Crystal City, Virginia. Many thanks to all of you who joined us—we had over 1,100 registered attendees! Participants gained knowledge in a number of cross-cutting areas such as systems alignment, stakeholder and family engagement, evidence-based intervention strategies, and assessments and progress monitoring. We had some phenomenal speakers and presenters on our panels and at our sessions, including U.S. Secretary of Education Betsy DeVos! You can view her remarks here. Please take the time to explore our vast collection of presentations and additional resources from the conference, now available on the conference website. You can also access evaluations for the overall conference and individual sessions here. This month, I had the opportunity to attend the Council for Exceptional Children's (CEC) 2017 Special Education Legislative Summit alongside around 250 other participants. 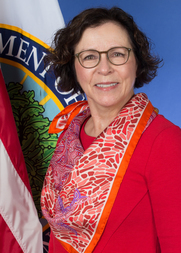 Office of Special Education and Rehabilitative Services (OSERS) Acting Assistant Secretary Kim Richey gave remarks that were followed by a listening session for OSERS. We learned quite a bit from those who shared their most pressing issues. We heard from stakeholders on issues ranging from rural education to charter schools, to English learners with disabilities. We truly appreciate any opportunity to hear from you, our stakeholders, as sessions such as this help shape the tools and policy we develop. On a final note, I would like to remind you of the regulatory reform work the Department is undertaking, in accordance with Executive Order 13777. In June we published a Federal Register notice as part of this process, that describes how the public can submit comments regarding regulations and policy guidance they recommend ED review, modify, or repeal. Comments are due by Aug. 21, 2017. You can view such documents for OSEP here. 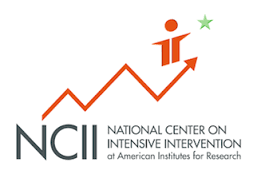 The comment period for each of these ICRs is 60 days and will be open until Sept. 11, 2017. "Rosa's Law," or Public Law 111-256, was signed in 2010, thus enacting changes to sections of the Individuals with Disabilities Education Act (IDEA) and the Rehabilitation Act of 1973, as amended (Rehabilitation Act). The law requires removing the words “mental retardation” and replacing them with the words “intellectual disability” or “intellectual disabilities” in federal statute and regulations. Final regulations that reflect these conforming changes to both IDEA and the Rehabilitation Act were published in the Federal Register on July 11, 2017. 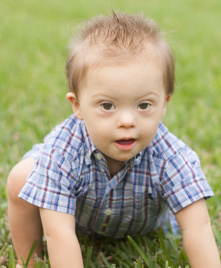 OSERS is requesting public comments on a proposed revision of an existing information collection, the Report of Infants and Toddlers Receiving Early Intervention Services and of Program Settings Where Services are Provided in Accordance with Part C, and Report on Infants and Toddlers. This collection provides instructions and forms necessary for states to report 1) the number of children receiving early intervention services under Part C of IDEA, 2) the settings in which these children are provided services, and 3) the reasons by which these children exit Part C of IDEA. Interested persons are invited to submit comments on or before Aug. 21, 2017. IRIS Center Modules Endorsed as "DEC Recommended Practices"
Two modules developed by the OSEP-funded IRIS Center have been recognized by CEC's Division of Early Childhood (DEC), and endorsed as "DEC Recommended Practices." You can read more about this distinction here. The two modules are 1) Early Childhood Environments: Designing Effective Classrooms and 2) Early Childhood Behavior Management: Developing and Teaching Rules. 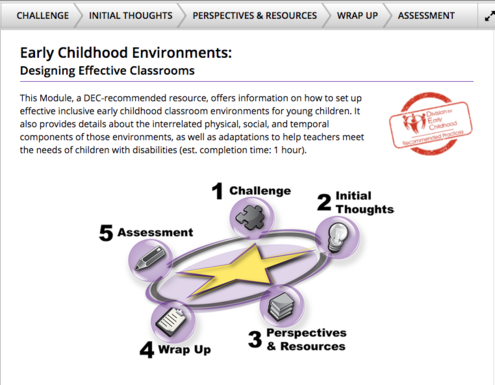 The image below shows the layout of each module, where the work is divided into 5 parts, 1) Challenge, 2) Initial Thoughts, 3) Perspectives & Resources, 4) Wrap Up, and 5) Assessment. The OSEP-funded center NCII has recently expanded its collection of sample lessons and videos. These resources are designed to assist special education teachers, interventionists, and others working with students with intensive reading or mathematics needs. On the topic of reading, sample lessons include activities and companion materials to address the needs of students struggling in phonological or phonemic awareness, decoding, fluency, vocabulary, or comprehension. Related to mathematics, sample lessons and activities include worksheets and supplemental resources to address the needs of students struggling with math concepts, including place value, basic facts, and counting. Accompanying the mathematics sample lessons and activities are a series of videos modeling instruction. States that submitted ESSA consolidated state plans are continuing to receive feedback from the Department. Feedback letters can be found here. States that have yet to submit plans have until Sept. 18, 2017 to do so. More information, including the timeline for submitting plans and related resources, can be found here. July's ESEA Convening and NASTID Summer Meeting, both here in D.C., were huge successes. State-level participants from special education and general education programs had the opportunity to learn about peer states’ work and new resources. There was also an opportunity to consult with peers and subject-matter experts on specific state-selected topics relevant to the design and implementation of ESSA consolidated state plans. A highlight of the NASTID gathering was the speech given jointly by OSERS Acting Assistant Secretary Kim Richey and Office of Elementary and Secondary Education Acting Assistant Secretary Jason Botel. Their remarks provided helpful insights for attendees into the Department's priorities.